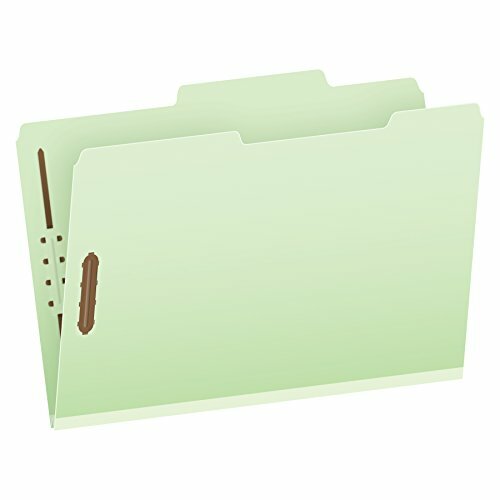 Pendaflex Pressboard Fastener Folders have durable hard covers with two embedded 2" fasteners to keep important papers in place front and back. A 1" expanding spine holds up to 200 sheets. Pressboard contains 60% recycled fiber with 30% post consumer fiber. Legal size, light green. 2/5-Cut right-of-center tabs. 25 Per box. View More In Top Tab Classification Folders. If you have any questions about this product by Globe Weis, contact us by completing and submitting the form below. If you are looking for a specif part number, please include it with your message.